I don't know if that is the appropriate title for this post but it would be if they keep up with the fighting. Previously only folks like Donald Low (I don't agree with most of his views) and Yeoh Lam Keong (brilliant, does his homework) were criticizing the government. Now the boss Kishore Mahbubani has probably inadvertently gotten involved or perhaps what was private has become public. To me Kausikan was plainly being mischievous. 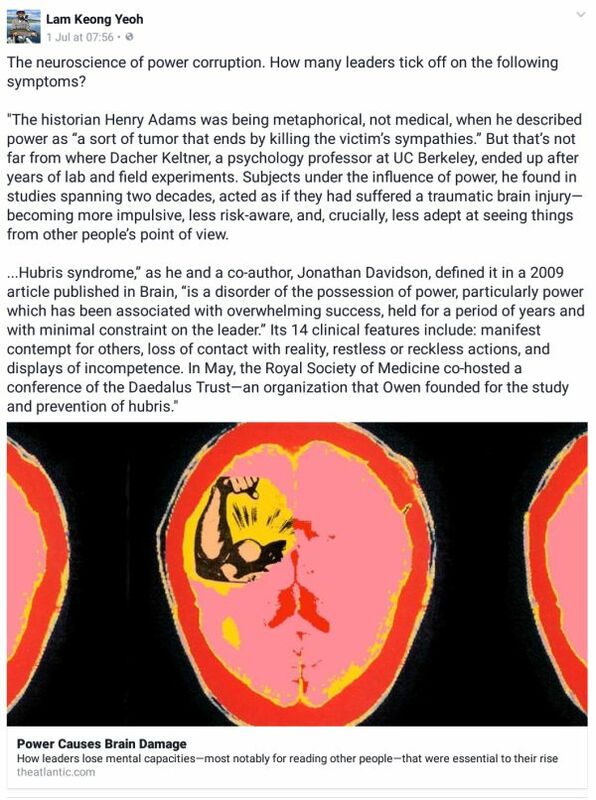 How on earth did he draw those conclusions from Mahbubani article? We would never have been a busybody or acted like Qatar. 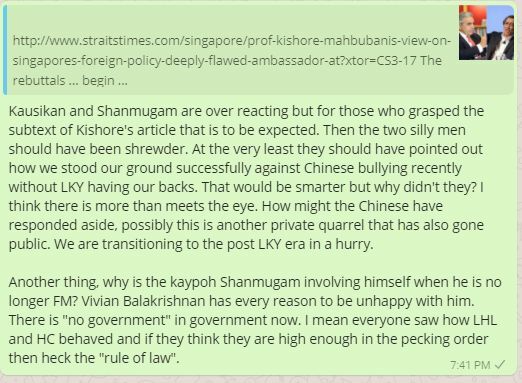 Ah, but there is a subtext in the article which elicited Kausikan and Shanmugam (shouldn't it be Vivian) to respond. 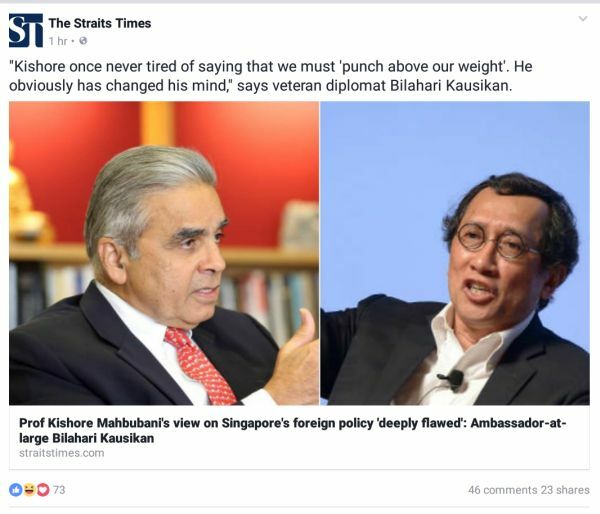 Mahbubani was implicitly suggesting that without LKY, GKS or Raja who would never have acted like Qatar have been doing, we now have a bunch of ministers and diplomats that are not the equal of LKY. Without the great man having our backs, we better make some sensible adjustments. Let's be honest and get real. The danger now is we have leaders who risk thinking better than they actually are and in time will jeopardize our well being and security. Unfortunately the emotional manner which they lashed out at Mahbubani suggest they are hiding deep insecurity which would invite foreign powers to test us. Well some like China had and I thought we clearly passed the test well enough. So I don't understand what is the problem. Must everyone in Singapore belong to the choir and sing from the same hymn book? Here are a couple of comment on the ST article on Kausikan response. 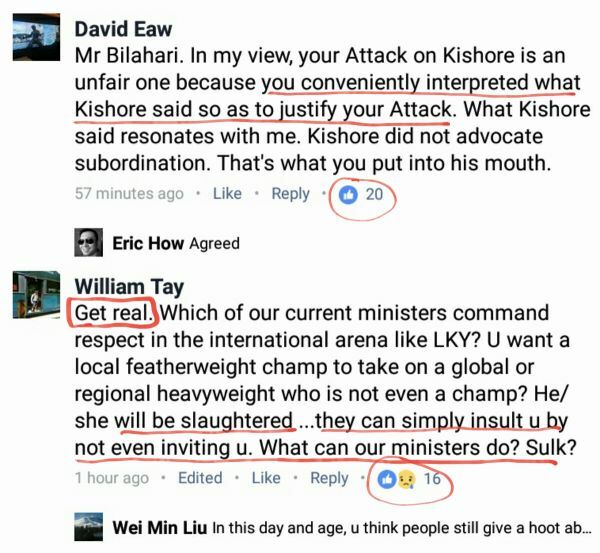 Kausikan gave many readers the impression that he is pretending to comprehend a passage below the standard expected of JC students offering GP. They still invite us especially Tharman at the IMF and G20 but there is no guarantee we will always have our seats unless we perform. So there is no need to quarrel about such things. Here Shanmugam is bringing up his bigger gun to fire on Kausikan's side. Isn't he over stepping into Vivian Balakrishnan's territory. Increasingly I don't trust this minister. May be he is some power hungry menace but still in the feeding phase. I have read this article before Yeoh Lam Keong. If the PM has seen it, I am sure he would not be pleased as it suggest all the not just years but decades he had spent in power, he is a prime candidate for power induced brain damage. I like to see an independent LKYSPP that is not afraid of the government. I hope they can stand up to the government successfully but it can be near impossible in the face of tyranny on Singapore territory. And where does tyranny comes from? The abuse of power of course and this will bring us back to the issue of the house at 38 Oxley Road. Voters must be careful to identify when the civil service and PAP self interest is equated as the national interest at our expense. Chee Hong Tat, not so clever is already spewing this at us. Remember the Population White Paper. My response at a chat. I come across as part of my unpredictable readings from the Bible this morning. This is from Joshua 7. When I saw that I thought of Moses who was Joshua's mentor. Moses could have done the same in Joshua's position but he would have been more likely to just talk the Lord directly. Moses was irreplaceable. This is not extraordinary but a pattern that is repeated throughout history. There are exceptions when a great leader is succeeded by an equal but it doesn't look that way for us. The Chinese were candid with us when then reminded LHL that he is not comparable to LKY. However there is nothing to stop us from trying but we have to bear in mind and not have wild ideas of what we are not. Jiang Wei did not act like he was the equal to Zhuge Liang. He was excellent but he knew he wasn't Kongming. That is what the honest patriot Kishore Mahbubani has urged us to do. There was no need for Kausikan or Shanmugam to over react. Singapore is tiny but not weak. We continue to punch above our weigh but it is just not the same without LKY. Better respect the fact or we shall repent in tears sometime. Fake diversions and stirring tea pot. Why are they suddenly "overreacting" and "michievious" at this point of time. Just another circus to divert the social media attention away from 38 oxley which they desperately want to move on.